560J6 Poly V Belt. INDUSTRIAL GRADE. 6 Ribx x 56" length. 560J4 Poly-V Belt. Metric 4-PJ1422 Drive Belt. 560J4 Belt (4-PJ1422). 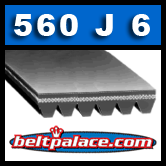 560J-4 Poly-V (Micro-V) Belts: 56� OC Length: J Section Motor Belt replaces fitness belts, compressor belts, drive belts, and electric motor belts. 560J-4 Poly-V Belt. 560J7 Poly-V Belt, Industrial Grade. Metric 7-PJ1422 Drive Belt. 560J7 Poly-V Belt. 56" Length, PJ1422/560J x 7 ribs Wide (5/8�) Belts replaces fitness belts, power tool drive belts, and other industrial motor belts. 560J-7 Micro-V Belt. 560J8 Poly-V Belt. ndustrial Grade Metric 8-PJ1422 Motor Belt. 560J8 Belt (8-PJ1422). Industrial Grade 560J-8 Poly-V (Micro-V) Belts: 56� OC Length: J Section Motor Belt replaces fitness belts, compressor belts, drive belts, and electric motor belts. 560J-8 Poly-V Belt. 560J10 Poly-V Belt. Metric 10-PJ1422 Motor Belt. 560J10 Industrial Grade Poly-V Belt. 56� Length, 10 Rib PJ1422/560J Belt replaces fitness equipment belts, compressor belts, and electric motor drive belts. 560J-10 rib Micro-V Belt (10-PJ1422).